Given this is Pitti Uomo week, it seems fitting to bring up the topic of sprezzatura, which readers requested a post on a couple of months ago. It is also fitting because the term is so misused, often in reference to Pitti. Sprezzatura doesn’t mean random splashes of eye-catching dandyism. Quite the opposite. It is the art of appearing stylish without any appearance of effort. To the lack of artifice, rather than its display. Bizarre, then, that the term is used in reference to strutting peacocks at Pitti, whose striving for style is so obvious. Why is this? Because there are many ways to give the appearance of nonchalance. One is to be truly comfortable, to have worn the same set of stylish clothes for so long that they feel like a second skin – and then have the confidence to be at ease in any social situation. A second is to leave bits of your clothing undone, or otherwise worn haphazardly, to give the impression you have forgotten about them. This second route is much easier, but rarely successful. Usually, the artifice is obvious. It looks painfully contrived. Unfortunately this second route is the one often taken up at Pitti, leading to things like undone monk-strap shoes, sloppy DBs, and shirt collars with the corners flipped up. These have then been equated with ‘quirks’ such as bowler hats, capes and pink shoes. This demonstrates how dependent sprezzatura is on context. If you’re the only man in the office that splays the blades of his tie, it could be seen as nonchalant. But if you’re at Pitti and seven other men are walking around doing it, and more importantly everyone is studying everyone else, then the artifice will be obvious. Much as we hate the fact, much about style, and certainly originality, is dependent on how the people around us dress. There are other routes to sprezzatura – to the appearance of nonchalance. Bruce listed several a few years ago in a nice article for Mr Porter. They include clothes that are obviously well-worn (Nancy Mitford: ‘All nice rooms are a bit shabby’), wearing vintage or inherited clothing, and combining casual and formal dress (ref. the trend for bracelets with tailoring – the perfect example of something that looks great until everyone else is doing it). It is no coincidence that so many lauded attributes of style have a sense of ‘ease’ at their core. Sprezzatura is clearly one, as is nonchalance, and even elegance – that so often misused word – requires grace and simplicity in its bearer. 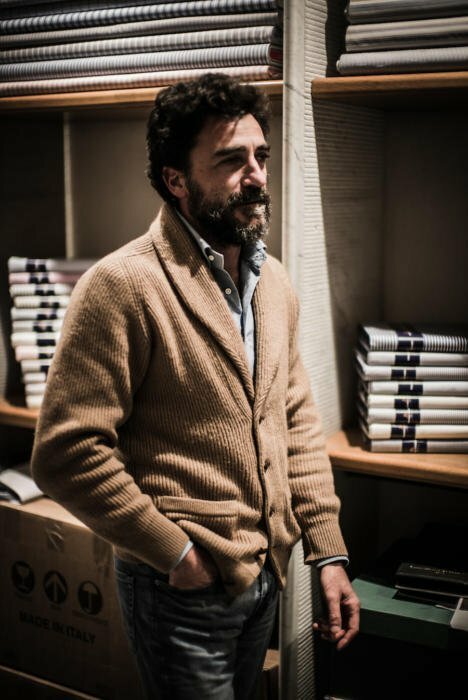 The men who have sprezzatura, therefore, are not the peacocks of Pitti but men like our friend Tommaso Capozzoli (pictured top). Tom cares about his clothes. He is specific with his collar shape (Simone Abbarchi), obsessed with the weight of trouser cloth (Holland & Sherry Pardessus), but always gives the impression that he has just thrown on the things that were at the front of wardrobe. When we saw him this time last year he had a cold, and came down in the morning wearing a thick, fisherman’s sweater, tracksuit bottoms and Adidas Stan Smiths. It was the first time in my life I’ve wanted a pair of tracksuit bottoms. You can follow the discussion on What is sprezzatura? by entering your email address in the box below. You will then receive an email every time a new comment is added. These will also contain a link to a page where you can stop the alerts, and remove all of your related data from the site. Simon, thank you, this is the best writing I have yet seen on sprezzatura, and grace. From it I learn a little of how to get there. Carefully selecting what you acquire and keep and what you discard, so that in a way it is what is at the front of the wardrobe. And the importance of context, a little different from the surroundings, but only a little and with subtlety, a texture, a colour, a pattern, an accessory, but not all together. This always raises an interesting question with me.. Can a young man have sprezz? Those who nail this look and in my opinion look the finest are those who are slightly older. OK I myself an not that young anymore but much of my wardrobe is new-ish, it has not had enough time to “wear in”, and I also consider myself to still be learning. Also maybe it does not look right with many young men of Pitti because, like myself their wardrobe has not lived enough yet? I do’nt want to tread on anyone’s toes here but if you look as if you are trying to hard you will lack style.That includes ostentatious displays of wealth….things like a large modern wristwatch…even if it’s a Patek or a modern Ferrari motor car. This is correct… I bought a watch last year. it took me ages to pick one because I wanted something that was worthy of the milestone birthday and a good investment. Also that didn’t make me look like i should be on a reality TV show. I did end up buying a Rolex but only because i found something I like which was not too large and didn’t “look like a Rolex” from a mile away. Its amazing that some of the shops didn’t seem to understand that I didn’t want something to show off. Nowadays, the tie quirks are never successful. I agree that the first route is the way to approach the subject in the long run. I have built myself a wardrobe that I feel comfortable in and I find myself forgetting about what I wear more often nowadays. I strive to be as comfortable in my clothes as Mr. Luciano Barbera when I get older. For Italian readers interested in sprezzatura I would suggest “Rosa Tiepolo” by Roberto Calasso. Simon was it you in Via Manzoni 15 minutes ago ? I’m reminded of Don Draper’s French father in law’s comments upon first meeting him. He harrumphed and said, “his manners are studied”. I’ve always thought that the current age of overt sprezz. is at least in part related to the way in which media is consumed on the internet. It seems to me that much of the classic definition arose from a certain bearing or disposition. That is, sitting just so, looking at ease, and never fussing with even the most fussy of clothing items (double breasted jackets and bow ties come to mind). This true nonchalance is really only communicable in person or at least in motion. With most recent style education being transmitted through static images online, we struggle for ways to communicate that same nonchalance. You can no longer rely on your relaxed demeanor, your languid manner of speech, or your arm loosely draped over a chair. Instead, you must communicate that same sense through an undisguised stylistic exclamation point: the unbuckled shoe, the long tie blade, etc. Photos on the internet must shout because they do not grant their subjects the ability to speak. You’re spot on about the Pitti style cliches: the monks, the collars, the bracelets, etc. No doubt a certain American Sartorialist will fall for them. We’ll see – and pity – the Pitti peacocks when the show starts. I see it as a variation on Hardy Amies’s advice, “A man should look as if he has bought his clothes with intelligence, put them on with care and then forgotten all about them.” With spretzzatura, “put them on with care” does not imply ‘neatness’ or perfect composition. Exactly, so many sayings come back to the same idea of grace and ease. Striving for sprezz seems like a contradiction of terms. First and foremost, be who you are. Wear what you love… Not what you think others will love. Don’t be afraid to wear clothes that are ‘out of style.’ If your wardrobe is a genuine reflection of yourself, interesting combinations can come together effortlessly. Your very well crafted finish to this piece is sprezzatura too. Thanks for this Simon, the link to Boyer’s article was also welcome. One other element of ‘Sprezz’ I’ve noticed is the mixing of superficially discordant elements that, weirdly, work together. You point to this re. the tracksuit bottoms, something also shown in Polo’s last Autumn/Winter catalogue. This in turn reflects a carelessly chaotic but creative wardrobe to hand, or, an inherited range of classic oddities. It seems from the article that the best expression is a sense of wit in each outfit, a wink to the observer that it’s all just for fun. Obviously, there are two steps envolved in order to reach the level at which one could be in the position to behave with sprezz. Mind you, this level is not merely a matter of look! It would be an easy task or rather easily achievable! For it can’t be a mask. Indeed, it’s at this level, that the mindset, what you call “grace”, comes into its own. Yet at that level, one doesn’t need to read PS anymore, I’m afraid! I don’t know if you are fully aware of that, Simon. An excellent post and, published as it was on the day of David Bowie’s sad passing, a timely one. He captured the essence of the word sprezzatura. Some may disagree and point to Simon’s antonymic description as proof (“eye catching dandyism” and “artifice”) but what supersedes all of that is, as Simon later says, to be so comfortable in your clothes that they feel like a second skin. But clothes will only ever feel that way if you are at ease in your first skin. That is what makes true sprezzatura so difficult to master and what David Bowie made look so simple. Isn’t following advice on how exactly to technically achieve nonchalance/sprezzatura exactly what would ensure such nonchalance/sprezzatura is not achieved? I think a very salient point has been made about sprezz being easier to achieve as one is older. By then a man will have had time to develop his style and will no longer be experimenting as much. He will also have certain staples that have aged with him and which he is totally at ease in wearing. You could draw a comparison between Jake from the Armoury on the one hand and Boyer and Tomasso (above) on the other. All three dress stupendously, but I cannot see the ease the later two have in the former. I also cannot stand the affected, deliberate attempts at nonchalance and I am glad to see the author and other commenters deriding them. The extra long narrow tie blade dangling down like a second appendage is particularly irksome. An unmentioned element of real sprezz: confidence. Genuine confidence will show up in body language, making sure it doesn’t sabotage otherwise beautiful attire. At the end of the day, those that struggle in this arena are nearly always trend followers. Wear a shrunken suit with your trousers at half mast. Leave your monk straps undone. Your tie blade too long. Your button down shirt collar unbuttoned. Sport loads of bangles and an oversized garish watch. Don’t wear socks and top it all off with a pocket square, hat, shades, man bag and oversized scarf. Do all of this and guess what ? Yes, you will look a complete prat. Hopefully not a surprise for readers in this hallowed cyber hall. For real Sprezz think Alain Delon and Steve McQueen in their pomp not Pitti Preeners. When it comes to nationalities, ironically it’s the French that probably come out ahead. They do tend to understand that less is actually more and tend to eschew gross overconsumption. Great article Simon. I find the concept a very attractive one. It seems the key is unselfconsciousness. Whenever you wearing a new thing or outfit you’re intensely aware of it. Effecting sprezzatura seems to be about feeling relaxed and comfortable and unaware. It’s a lovely idea and one I think you get better at as you get older. David may laugh at Pitti but for the last 500 years Western art and fashion has had its footing in Italy. The Paris salon was inspired by the Renaissance greats, the architecture of England also (St. Paul’s) and Italy remains at the heart of international men’s fashion. The idea of Pitti (though infleuntial) is not dissimilar to the Detroit motor show; ideas are shown, fun is to be had, but none of it is to be taken too seriously. Sprezzatura is a quite elusive concept. After all, Castiglione’s Book of the Courtier was a bit of a pedagogical treatise (the Renaissance equivalent of PS?) and aimed at facilitating the emulation of a perceived role model, rather than at some kind of factual description. Sprezzatura can hence never really be “attained”; it says perhaps more something about the insecurity of those who perceive it in others, rather than about those to which it is ascribed. It’s a social construction. By the same token, you can probably not feel at ease in your clothes just by perfecting the art of choosing them. All of this is really in the eye of the beholder. Before the “Sprezza” expression became the mot de jour, elegance or elan were probably used to describe men who have an innate sense of style. One of the posters alluded to this being more evident in older men and this is probably true basically because they have learnt from their sartorial fopauxs, instinctively know what suits them, long ago gave up trying and wouldn’t be seen stiff at Pitti. The short route is to study the masters – you’ll get there earlier and save yourself a fortune in the process. I can’t help but let my mind drift towards the concept of shibumi (so playfully on display in Trevenian’s classic novel) when thinking of sprezzatura. Tranquil, everyday elegance and effortlessness. A concept so simple and yet so elusive. Very interesting post. And at times more caustic than you’re critique usually is. Shibumi has it in spades – I must re-read this and the prequel by Don Winslow. PS I wonder if Satori will ever get that long gestating film adaptation. I have a theory that sprezzatura – much like class, honesty, and sexual prowess – is inversely correlated with how often a person mentions it with regards to themselves. where is this amazing cardigan from? Re-read this article in a quiet moment. I find the photos we use to illustrate sprezzatura look as if they were taken in an unguarded moment. One where the subject is unaware he is being photographed. The clothing may have been chosen with great care or simply thrown on in a rush. But in the photo the subject is entirely himself, no pose or artifice is present. And that is the secret, to put the clothes on and then forget about them. I wonder if not styling your hair or sporting a unkept beard could be classed as sprezzatura? Being well dressed in a clothes perspective but very casual in a grooming styled sense, could tone down and relax ones appearance. Absolutely, and it’s about finding the right balance in the same way. I think that Sprezzatura is something natural that cannot be taught. What do you think Simon about that? I disagree to be honest. You can observe things that others do and take some of them on board; you can develop a greater ease in your clothes as you grow older; and you can have more confidence in general. All of these help make those deliberate things seems natural. My perception is that (particularly) Italian men and women from all walks of life make the effort…. Their clothes may be high end or budget but hair is neat, clothes are well chosen, shoes and scarves are considered. In this regard respect is shown to others and oneself, and perhaps the result is life-enhancing.